Wireless and sensor research at UW CSE aims to improve the connection between information systems and the physical world by developing new sensors and new ways to power and communicate with them, including new methods for harvesting power from wireless signals. Our research is creating improvements in a range of fields including communications, energy transmission, medical devices, and robotics. Wireless and sensor innovation at UW CSE is also powering the “Internet of Things,” pushing the boundaries of this exciting field. AllSee, the first gesture-recognition system that can operate on a range of computing devices, including those with no batteries. Existing gesture-recognition systems consume significant power and computational resources that limit how they may be used in low-end devices. AllSee consumes three to four orders of magnitude lower power than state-of-the-art systems and can enable always-on gesture recognition for smartphones and tablets. Ambient Backscatter, a system that transforms existing wireless signals into both a source of power and a communication medium. This novel technique enables devices to communicate among themselves at unprecedented scales and in locations that were previously inaccessible by transmitting data using Wi-Fi, television, radio, and cellular signals, and eliminating the need for batteries. 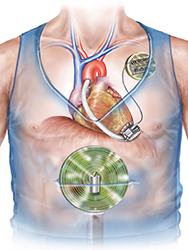 Free-range Resonant Electrical Energy Delivery (FREE-D), a wireless system that efficiently transfers power to an artificial heart using magnetically coupled resonators. The FREE-D system wirelessly transfers power over meter distances, freeing heart patients from the dangers of infection from the traditional driveline, a cable that protrudes from the patient’s abdomen. Wi-Fi Backscatter, a novel technology that enables devices to communicate with Wi-Fi enabled devices with orders of magnitude less power. 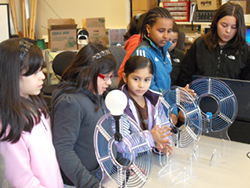 Traditional Wi-Fi communication requires generating complex signals that consume power. In contrast, Wi-Fi Backscatter enables communication by reflecting existing Wi-Fi signals instead of generating them – enabling Wi-Fi connectivity with only tens of microwatts of power. Wi-Fi Imaging, a project that explores the feasibility of achieving computational imaging of objects and people using Wi-Fi signals. Our system, called Wision, leverages multi-path propagation that results in wireless signals bouncing off of objects before arriving at the receiver. Using Wision, we demonstrate the ability to image objects such as leather couches and metallic shapes - even those behind walls. 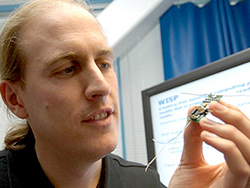 WISP (Wireless Identification and Sensing Platform), a battery-free, RF-powered platform for sensing and computing that has been adopted many researchers around the world. Wireless Resonant Energy Link (WREL), a system that enables the efficient transfer of up to 50 watts of power wirelessly over medium distances. Unlike most wireless power systems, WREL’s efficiency within range is not affected by changes in distance between transmitter and receiver. Researchers at UW CSE are exploring the use of WREL to wirelessly power implanted medical devices. Our work has received extensive coverage in the media, including The Economist, MIT Technology Review, The New York Times, and The Seattle Times. Visit the Sensor Systems Lab, Networks & Mobile Systems Lab, and UbiComp Lab to discover the people and projects that make UW CSE a leading center of wireless and sensor research, and learn more about our expertise in human-computer interaction, systems and networking and ubiquitous computing.